DJ Adira (Emma Holder) has been shaking and Stirring the Portland + environs airwaves for over 8 years. 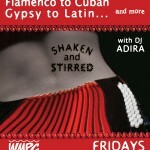 She spins a bombastic mix of Global dance music; African, Balkan, French, Latin, Tango, Middle Eastern, Swing... you name it. Plus interesting guests with important things to say about local issues, music, the Arts, sustainability, food, energy and bikes.